A Microsoft Certified Solutions Expert certification puts you at the top of the list for many different IT specialties. The benefits of an MCSE are many and may include a promotion and/or salary increase at your current job or the possibility for you to upgrade to a new position somewhere else. The word “Expert” is right in the title, and it conveys that you are just that to employers. In September 2016, Microsoft reorganized the MCSE certification paths to align to industry recognized areas of competence. 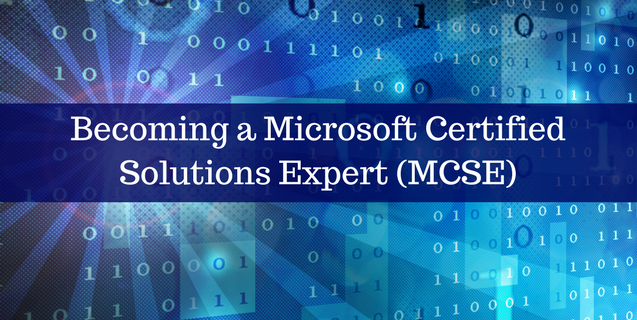 The path to an MCSE under new certification paths requires earning a Microsoft Certified Solutions Associate (MCSA) credential in your area of choice first. An MCSE can then be gained in the same area of competence by passing one additional elective exam. Let’s go over the different MCSE Certifications and what type of position each certification applies to. The MCSE Mobility certification focuses on the skills needed to manage and support clients and devices in the enterprise. Typical positions include desktop support technician, help desk and systems administration. Achieving an MCSE in Mobility requires earning an MCSA in Windows 10 and then taking one additional elective covering Deploying Windows, Administering Systems Center or Managing Devices in the Enterprise. Windows Server will show your competence with server administration and networking technologies that will help you to efficiently run a data center. Linux on Azure will prove your ability to implement and maintain cloud-enabled Linux solutions that leverage the Microsoft Azure platform. Cloud Platform will validate your skills in being able to architect and maintain Microsoft Azure solutions to deliver reduced cost and added value. An MCSE Productivity would be a plus for positions supporting one or more of the business application servers such as SharePoint, Exchange, Skype for Business either installed on premise or running on the Azure cloud platform. The MCSE Productivity certification offers electives in SharePoint, Skype for Business, Exchange Server and Azure Infrastructure. One elective is required to earn an MCSE Productivity after earning a related MCSA certification. There are two MCSA certification paths that you can pursue as a prerequisite to the MCSE. If your organization is running on-premise versions of SharePoint or Exchange then you would take the Windows Server prerequisite. For those organizations running hosted versions on the Office 365 platform, the Office 365 prerequisite would be the first step. Office 365 will validate your skills in being able to administer cloud-hosted business applications on Office 365 such as Exchange, SharePoint and Skype for Business. SQL Server proves a base level of knowledge in administration and querying SQL databases. This certification is useful as an entry into database administration and development. Database Development shows the skills needed to design and implement high-performance enterprise databases. Database Administration provides a skillset in database installation, maintenance, configuration and provisioning. This certification is useful for database administrators. Business Intelligence Development assures employers that you know how to get data into and out of SQL Server (Extract, Transfer and Load) and use multidimensional as well as tabular data models. This certification can lead to a position as a Business Intelligence Developer. Electives in this area are available for developing, designing and implementing databases with Microsoft SQL Server. The above certifications can validate you as an expert in Microsoft technologies and qualify you for a range of different positions in business information technology. That also makes sure that you are qualified as a valuable resource to your current or future employer. Additionally, updating your certifications as technologies change is a good way to let them know that you are continuing to grow as an IT professional. If you’re interested in getting MCSE certified, you should contact ONLC today.